These are the most common products, if you want something else, let us know. We can produce any size you want from 2x2 up to 22x28. This is usually for Every Door Direct Mail (in 100s), but can be used for any product. Bundling is $1.25 per bundle with a $29 minimum. Address Delivers To Our Local Business Mail Post Office. It includes individually addressing each piece. It does NOT include postage. EDDM Prep Bundles and Prepares and Qualifies At Our Local Business Mail Post Office. Then It Ships To Your Destination Post Office. It does NOT include postage. Prices posted on this website are subject to change without notice. We are not responsible for typographical errors. Written estimates are good for 30 days. An estimate not accepted within 30 days may be changed. All orders must be prepaid due to the speed of our turnaround. We reserve the right to use its sole discretion in refusing to print anything it deems improper or known to be illegal. We are not liable for any damages resulting from any violation of copyright laws or illegal use of trade names or slogans. The client guarantees the legal title of all matter submitted to us for printing and/or publication. Cancelled orders require compensation for incurred costs and related obligations at the time of cancellation. Due to the speed of our turnaround, you may only cancel a job the same business day you place your order. A minimum charge of $35 is applied to jobs cancelled before our evening cutoff time of 6pm. A minimum charge of $50 is applied to jobs cancelled after 6pm. No refunds will be given for orders cancelled after 8pm of the same business day the order was placed. Quotations are based on the accuracy of the specifications provided. We can requote a job at the time of submission if the art does not conform to the information on which the original estimate was based. Orders placed are, to the client's knowledge correct, and there are no conditions or agreements relating to the order which are not written or accompanying said order. Our liability shall be limited to the stated selling price to the customer of any defective goods, and shall in no event include special, consequential, incidental, indirect or similar damages, including without limitation, lost profits. We warrant that every product manufactured by it meets industry standard for such product and is free of any material defect in workmanship. IT IS EXPRESSLY AGREED THAT THIS WARRANTY IS IN LIEU OF ALL WARRANTIES OF FITNESS FOR PARTICULAR USE AND MERCHANTABILITY. We make no other warranty and no actions or words of our officers, employees or agents shall constitute a warranty. 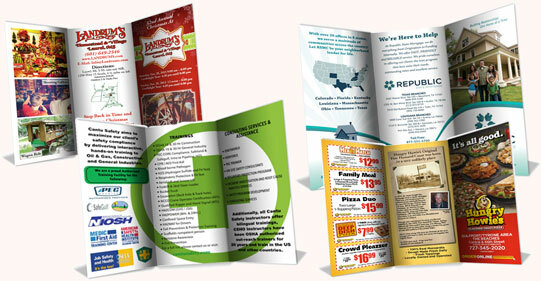 The customer represents that it has the legal right to produce all printed materials. In the event that a charge, claim or demand, or arbitration, action or proceeding (collectively, a "Claim") is made or commenced against us, based upon, relating to or arising from the alleged wrongful acts of the customers, or alleging that the printing performed or product produced by us and ordered by the customer: (a.) infringes any copyright, patent or other proprietary right of any person; or (b.) contains matter that is libelous, slanderous, defamatory, scandalous or obscene, the customer shall indemnify and hold us harmless from and against any loss, damages, cost and expense arising from or related to the Claim including without limitation; (1.) defending us against any such Claim (2.) paying any judgment or award against the customer; and (3.) reimbursing us for any legal fees and expenses it reasonably incurs in responding. It is the client's responsibility to maintain a copy of the original computer files, artwork and transparencies. We are not responsible for accidental loss or damage to media supplied by the client or for errors on supplied artwork furnished by the client. Until we can evaluate digital input, no claims or promises are made about our ability to work with jobs submitted in digital format, and no liability is assumed for problems that may arise. Any additional translating, editing, or programming needed to utilize client-supplied files will be charged at our current rates. We do not archive your work for longer than it takes to produce the final product. Please save your work! Client alterations must be specified in writing and must include all corrections or changes from the original specifications. Such work will be charged at our current rates. We will normally deliver the exact quantity of goods ordered plus a small additional amount. There is no extra charge for the additional amount. In the event of an underrun, we will bill for the actual quantity delivered. The generally accepted trade practice is plus or minus 5%. Charges for delivery of materials and supplies from the client or the client's supplier to us are not included in quotations unless specified. We are not responsible for delays and/or damage incurred during shipping. Title for finished work passes to the customer upon delivery to the carrier at shipping point; or upon mailing of invoices for the finished work or its segments, whichever comes first. Claims for defects, damages, or shortages must be made by the client in writing no later than 10 calendar days after delivery. If no such claim is made, the client will understand that the job has been accepted. By accepting the job, the client acknowledges that our performance has fully satisfied all terms, conditions and specifications. We shall have the right to assign any portion of the work required to another contractor. We guarantee all orders to be free of defects in workmanship. If any order does not match the generally accepted trade standards, we will reprint the order or issue the customer a refund at our discretion. We strive on meeting all reasonable deadlines that are agreed upon. We estimate that all orders will be ready to ship within the turnaround time listed under the product you are ordering. Turnaround times are estimated from the time you complete your order with payment. Folded, scored, die cut, or any other jobs that require any production besides printing and cutting may require several extra days. Any information we collect from order processing or from any inquiries is not shared with any other company. Your information is only used for contact, billing, and shipping purposes. Your credit card information is never stored by us. It is securely stored on Bank of America's servers. We might use your product for samples or advertising purposes. You may opt out in writing if desired. Your credit card bill will read "Fast Color Printer 727-828-1561." Inkjet and laser prints are known to look substantially different than offset printing. We offer quick turnaround and low prices by printing to a "pleasing color" standard, using standard ink densities. There is no guarantee that your finished piece will match your printed sample. This is due to the varying results from different output devices including inkjet printers, continuous tone proofing devices, and film-based proofs. Creative work developed by us is our exclusive property. We must give written approval for all use of this work and for any derivation of ideas from it. If said party wishes to obtain editable files from us, we can deny any request, or negotiate a price to which creatives are valued. We may change, modify, add or remove portions of this policy at any time, and any changes will become effective immediately upon being posted unless we tell you otherwise. This policy was last changed on Dec 2, 2013. I understand I will bill myself exactly when I click "Buy Now". Would Like To Chat With You.